There are lots of restaurants popping up around central London, that have adopted a “stripped back”dining style; short menus, no bookings, affordable prices and tasty cocktails. 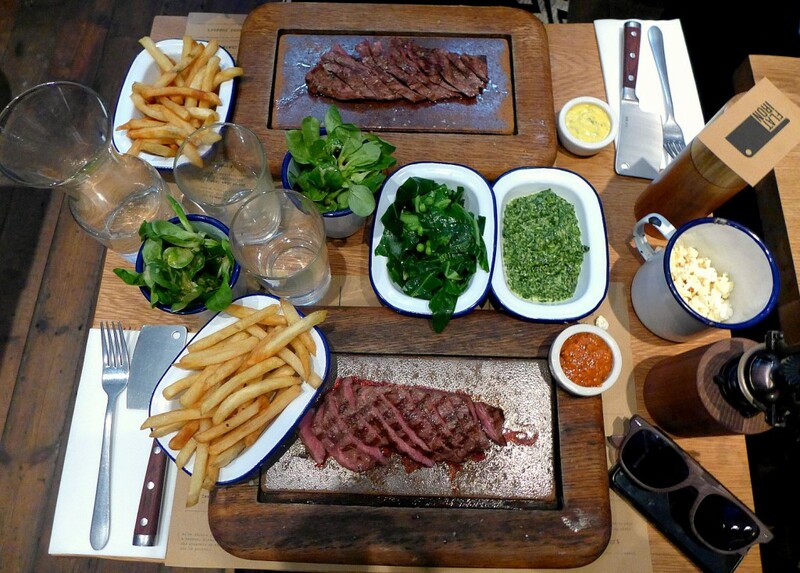 One such place I happened to visit is Flat Iron steak restaurant in Bloomsbury. There are no starters and limited desserts. This is clearly a winning formula that has restaurants such as Burger & Lobster, MEAT Liquor and now Flat Iron, managing lengthy queues of hungry diners. Flat Iron, as the name implies, offers a limited menu of flat iron (shoulder cuts) steak with a house salad garnish at £10 a pop. Due to the cut of meat used, Flat Iron recommend having your steak cooked medium-rare. Being the wuss that I am, I ordered my steak medium (I am usually a medium-well kinda gal) and , medium is probably as far as you can push it before you will be eating meat leather for dinner. I have never tried this cut of steak before, but really enjoyed it. The flat iron cut has a good marbling of fat, which, if cooked right, as this steak was, produces tender mouthfuls of steak, for a significantly cheaper price than a rib-eye steak. It’s a small steak, so definitely get sides or you’ll leave feeling hungry. Sides on offer include fries, creamed spinach, salads and steak sauces. I opted for dripping cooked chips – delicious, if a little oily and, market greens – which were pleasant enough but kind of boring. The creamed spinach was also really good. If I were you, I’d go for the creamed spinach and dripping cooked fries. There’s even free water on the table, which is always a nice touch. Flat Iron is not a fancy steakhouse, nor does it pretend to be. If you are strapped for cash and planning to go out for a steak dinner, you should probably reassess your spending habits. 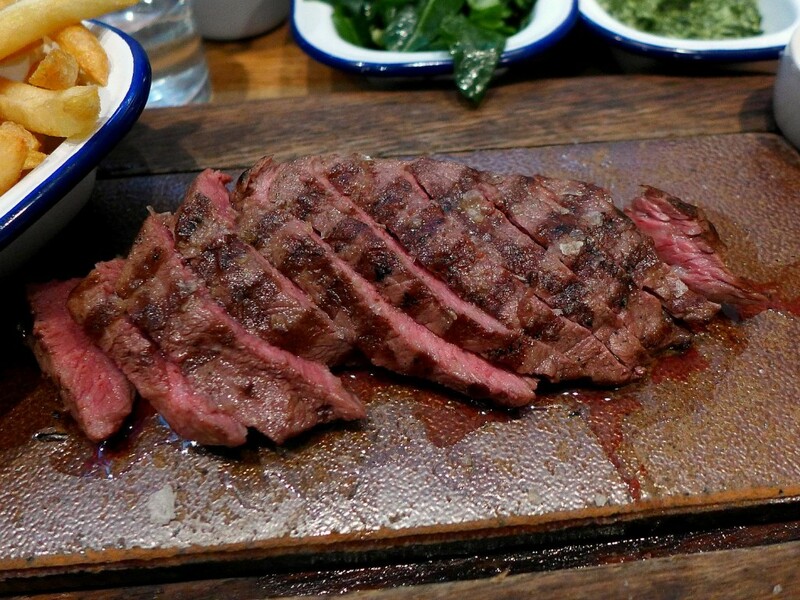 However, if steak is all that will do, then Flat Iron is a fantastic choice! Full disclosure; it’s not technically £10 for a steak dinner. Its £10 plus the cost of sides, a 12.5% service charge and a small donation to charity (Sidenote – I like that Flat Iron’s management agree to match customer donations at the end of each month; our sever explained that the proceeds go to Macmillan). Conclusion? For under £15, you can have a steak, chips & salad dinner, and support a good cause at the same time – I’d still say that’s a deal! Dining tip: try to visit during a weekday and before 7pm when the evening rush begins. Do you think Flat Iron restaurant is good value for money or do you prefer more upmarket steakhouses? Let me know in the comments below!